In recent years, representatives from all three Baltic states have worked together in a bid to claim compensation from Russia for damages sustained during the illegal occupation of the three countries by the Soviet Union between the 1940s and the restoration of their independence in 1991. By contrast, a narrative popular in Russia presents Estonia, Latvia and Lithuania as ungrateful, claiming that all three countries were industrially built up and developed due to investment from the Soviet Union – there have been occasional attempts to claim the Baltics should refund Russia for infrastructure constructed. 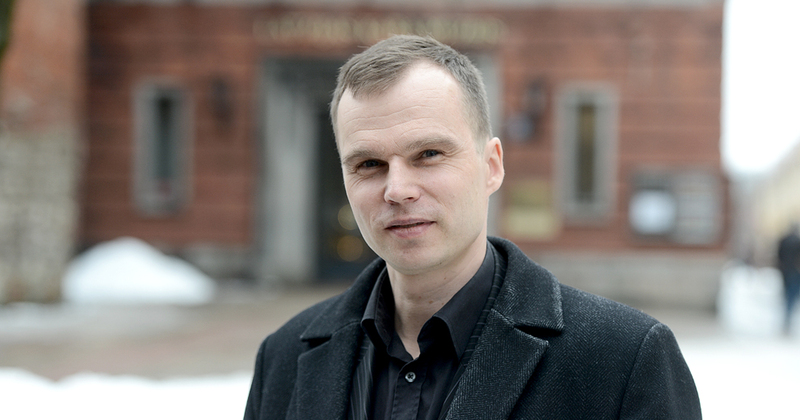 The recently published work of the Latvian economic historian Gatis Krūmiņš has gained a lot of attention for its apparent debunking of this particular line of argument. Krūmiņš’s study is the result of years of work, relying on confidential financial documents that were left in the Bank of Latvia in Riga after the collapse of the Soviet Union. Krūmiņš’s calculations based on these documents appear to show that, actually, Latvia – in common with all of the Baltic states – was a net contributors to the Soviet budget, and that huge proportions of the republic’s budget were allocated to Soviet military stationed on its territory. Deep Baltic’s Will Mawhood met with Krūmiņš in Valmiera in northern Latvia, where is the rector of the local university, Vidzemes Augtskola. What caused you to start this research? My field is economic history, and ten years ago, I prepared my doctoral work, and my focus was on economics – Soviet economics. My dissertation theme was agrarian reform in Latvia from 1988 to 1993 – this was the time of the collapse of the USSR. It’s always been very interesting or me to look at periods where there is a lot of change. Of course, we have in our history a lot of turbulent periods and we have other periods that were more or less stable. I found that the Soviet period hadn’t been researched in the field of economics – because we have a lot of publications about reparations, about policies, but not about economics. Some years ago, the Bank of Latvia organised a research grant, and they published a large book, and I was responsible for the period of the Second World War, and the post-war period – the Soviet period. And they asked of course to find something interesting about the Soviet period. I looked at some general documents. For me, it was important before this research to find out what relations were like with Soviet central government. How deeply were they involved in financial policies? What kind of decisions could we make independently? Because the Bank of Latvia was not an independent bank; it was a branch of the Soviet central bank. For all of the period, you can definitely find everything. Some years ago, I presented it at a conference where there were other historians there. And they said “no, it cannot be true, because we believe in our society that there was a lot of investment”. But it is a myth – really a myth. And all of our society, because there were no other facts, we believed that it was true. But I calculated that it was really not the case – that, in reality, we paid more into the Soviet central budget than we received back. How academic do you think this discussion is? Most countries accept that the occupation of the Baltic states was illegal, so whether Latvia paid to Russia or Russia paid to Latvia, does this matter? Surely if we accept that this was not acceptable, it doesn’t make a difference? This is the compensation that Russia wants from the Baltic states? Yes. We have this commission, and this commission partly supports my research. But I’ve always said that my general thing is to find documents and show this in the academic field. Of course, a lot of politicians use the research, from both sides – from the Latvian side they use it to say: you should pay for it. Of course the Russians say “no, we invested a lot in this”. Of course, the question is politicised to a high level. And yes unfortunately, we see that in this discussion… for example, I have one interesting example about Estonia. My research is about Latvia, but I was also in Lithuania and in Estonia last year. I found the same documents [relating to Estonia and Lithuania], because of course this methodology in the Soviet system was the same. And it was the same situation: nobody in Lithuania or in Estonia had found such documents before me and I just gave some examples about Estonia, it was about twenty seconds of a video from the Russian side, it was about Estonia, and I found some documents and said “no, in Estonia the principle was the same – so Estonians paid a lot of money [back to the central budget].” This video was published by Stratcom in Brussels, and also retweeted by Toomas Hendrik Ilves, the former president of Estonia, and in Estonia a discussion opened about that. But Estonians concentrated only on these twenty seconds about Estonia. What was this twenty-second clip? They asked some older-generation academics, and they said “it’s politics. The Latvians are trying to open the discussion for political issues,” or something like that. And there was a large interview with me in the [Estonian] newspaper Postimees, and they asked me a lot of questions, but they focused just on this political side. But I said that it’s very important for society to understand the past, and deconstruct myths about the past. And because of that, I’m speaking about that – I’m not starting a discussion about compensation or anything like that, and who is sorry about what happened. Because this is another question: is Russia responsible for this or not? I think not. Because as Boris Yeltsin, the first president of the Russian Federation, said when he was in Latvia, Russia is not the USSR. And I believe that is true. Because he said that we – the Baltic states and Russia – we tried to destroy the Soviet Union. Remember in the early ‘90s, there was a very big confrontation between Gorbachev and Yeltsin – and because Yeltsin stopped this central payment and investment into the Soviet central budget [from the Russian SSR], it was possible to destroy the Soviet economic system. And of course without that, Gorbachev had a budget deficit of about 40-50%; it was not possible to organise this big country. Russians in their strategic communications have returned to the Soviet era, and said that, for example, the central event of the 20th century was the world war and so on. But in reality, Russia is not so responsible for this, because there is not a direct continuity between Russia and the Soviet Union. Of course they are responsible for nuclear weapons, a lot of other things. And of course now they are building their own strategy, and they have said that we have a sphere of influence: the territory of the whole former Soviet Union, and the Baltic states [are included]. So you were talking about the political aspect of your work. I agree that your research doesn’t necessarily prove that Russia should pay Latvia compensation. But people do sometimes say that Latvia should pay Russia compensation – for this industry, this infrastructure, etc. It does disprove this, right? You’re talking about the minorities, here? Yeah, yeah. They tried to develop other industries in Latvia, because of the good examples from the ‘20s and ‘30s. It’s a myth that Latvia was a totally agricultural land [before the Soviet occupation]. This is really a myth – and one reason for this myth is because this government of the ‘30s, the authoritarian government of Kārlis Ulmanis [in power between 1934 and 1940], they tried to develop agriculture – he was a fan of agriculture, and he tried to somehow develop and support agriculture. But the development of industry was much higher – we produced a lot – we can say they were the start-ups of the ‘30s. For example, the VEF Minox, the smallest photo camera in the world, it was produced here, in Riga. We produced, if we compare for example the Soviet Union and Latvia in 1939, radios – we produced about 25% as much as everything that was produced by the Soviet Union. And we produced a lot of other things. Of course there are a lot of different methods, but if we compare living standards in Latvia and living standards in the Soviet Union – of course living standards, for workers and for everyone was much higher [in Latvia]. During the Soviet times, year-by-year we lost these standards. I wanted to ask about the devaluation of the lat [the currency of independent Latvia], which happened very quickly after the occupation. How important was this in terms of achieving their goal? This was a policy which big countries carried out when occupying small countries. And this is a policy by which you can give your citizens or your army, you can give them better prospects, if we compare with people from this country [the occupied country]. And this method was used not only by the Soviet Union, but also Nazi Germany. If we compare the Latvian lat and the Soviet ruble [at the beginning of the occupation]: on the free market you could buy ten, fifteen times more products than with the Soviet ruble. This [devaluation] was part of Soviet policy, and it was important for many things. First, of course, because after that, you can compare in economics, in statistics that one ruble is one lat – you can show the level of production in lats was four, five, seven times lower than it was in reality, when compared with rubles. This is of course one thing, and another thing is that the situation was totally different. Because in Latvia, although it was wartime in Europe, we were not involved and it was possible to buy everything – there was an open market for everything. And agricultural production was very cheap. In the Soviet Union at this time, the situation was different – the possibility to buy anything was limited in shops, there was only a minimum of everything – there was a system of cards, which worked like a currency. I think this was a political decision, to say one lat is one ruble. And after that of course, they saw that it is not normal – you can buy for one lat five, seven, ten times more than you can for one ruble in the Soviet territories. And so two or three months later, they devalued the lat. But it was the same attitude used by Germany in the Netherlands, in Czechoslovakia, in France. It was a political decision about the currencies, and of course, if you are from this country [the occupying country] you can buy everything very cheaply. This is just a tool to give prosperity to your people – your bureaucrats, your workers… Everyone who received money in Soviet rubles in Latvia could buy ten times more. So the statistics afterwards were based on these artificial figures? This is why you feel they are not useful? Yes, of course. Because if you compare this in lats – if one litre of milk in Latvia is ten times cheaper than in the Soviet Union, and the same with salaries and so on. And they of course partly use this – “in the Soviet Union, people received more money [in wages]”. For example, 200 rubles in one month in the Soviet Union, and in Latvia only 120 lats. But if you compare what you can buy for 200 rubles and 120 lats, of course, it’s not comparable. You point out that Latvia was not a fully agricultural economy – it was an industrialised economy before this. And you mention that in your research, it was often described in Soviet propaganda as “an agrarian adjunct of imperialist countries.” But this is something that was promoted by Kārlis Ulmanis – you know, he promoted Latvia as an agricultural economy. Why did he do this if this was not true? It was a cornerstone of his ideology. He said that peasants and everything that comes from the land was very good. He was the leader of an agrarian party [the Farmers’ Union of Latvia]. In his ideology, he always said that “we are an agrarian country”, and of course if you see some publications from this time, it’s all about that. But it’s interesting that they developed at this time a lot of big projects – for example, this electrical station, Ķegums, the largest on the Daugava [the principal river of Latvia]. Of course it was very important for industry, because electricity was very, very important and it was a step to developing industry. But I think it was more for emotional reasons for him – because in his time, in the ‘30s, the number of factories increased, the number of workers increased, and we imported a lot of people from other countries to work in the agricultural sector. And in the agricultural sector, we had a very big problem because of agrarian reform, when we divided up the big farms of the aristocrats into small properties – 22 hectares. This is very small; you cannot buy a tractor for 22 hectares – you can just buy a horse, or two horses. Modernisation of agriculture was not possible on small properties, small agri-firms. And of course, he was one of one of the people responsible for this agricultural reform. I think that he and another of his supporters, they tried to support this, because they thought that they are responsible, and they could see that people preferred to go to the cities to work because working in the agricultural sector was very hard. Of course it was easier to go to the cities. It was only because in Lithuania, the situation was much worse, and from Poland, we imported – I don’t remember… less than 100,000, but a lot of people, to work in the agricultural sector. Of course they evacuated everything – all the industry, and a big part of workers to Soviet territories. It was not possible to return back – for some small factories, it was possible, but in general, they lost everything from that. And of course, we lost not only a market for industry, but the experience of people and the education system. People were very highly educated. Another thing is that Latvia was very multicultural – there were not only Latvians, there was also very high influence from Germans, Jews, Poles, Russian emigrants from the Soviet territories. So it was very multicultural. Jews, for example, were because of Nazi Germany – in the Holocaust. In 1939, Germans went to Nazi Germany – all of them. And, of course we lost this. Now we can speak about two parts of our society: Latvian-speaking and Russian-speaking. But a hundred years ago, Latvia was a very multicultural, multi-linguistic, multi-traditional land. For example, at the beginning of the twentieth century in the three biggest cities in Latvia – Riga, Liepāja and Daugavpils – no single nationality formed a majority. For example, in Riga about 40% were Latvians, 20% were Germans, then Jewish, Russian, Polish… And it was normal that educated people spoke three or four languages, so it was a very open society, and of course after the First World War, people asked how it was possible in such a destroyed territory for things to develop so fast. And of course one thing is that people believed in this new country – people worked a lot and worked hard. But another thing was this education and open society – this experience from the previous period. And this is another question, maybe, but if we compare the two periods: the ‘20s, when we gained our independence for the first time; and the ‘90s, after the collapse of the Soviet Union, when we regained our independence. [The ’90s] were much more complicated, because the Soviet experience, to a large extent, it was not useful for the free market, for relationships with Western countries – the Soviet economy, the Soviet education system without foreign languages – without English, for example, the language for business. And an understanding of how industry worked in the free market, of course we did not have this. Whether or not you support this, I don’t know, but your research is obviously going to be used to support this opinion that Latvia – and Estonia as well – would have been like Finland if there had been no occupation. Do you think this is probable, or do you think it’s too complicated to judge? We spoke about this question of Latvia before the war having been a multicultural society, with many different smaller groups and languages; whereas at the end of the Soviet occupation, it’s very different – it’s basically bicultural, and is very dominated by the Russian language [as a lingua franca], and worse inter-ethnic relations. Most the minorities at that time would have come here under the Soviet system, and they often feel very proud that “I came here, and I helped build this country from nothing…”. Is it not a possible risk if you then say to them, “your work was useless – or at least not helpful”, this will make these people feel even more alienated from modern Latvia? But it’s an issue not only for the Russian part of the population. Because I’ve discussed a lot of things also with people from the Latvian part of the population – and they remember this time, and they remember working in factories, and they remember big projects with high ambitions and so on. Of course, we had two information spaces in Soviet times, because Latvians – we had narratives from the past. But the Russians – to a large extent, immigrants from other territories – they just had the propaganda: before this [the Soviet Union], there was the fascist regime of Ulmanis, and Latvia was a poor and agricultural land, and now we come here and we build factories, and they should be happy about that. And if they’re not happy, they are bad nationalists. But even the Latvian part of the population remember this. Because we should remember the biggest part of the population of Latvia, they were born in the Soviet times – like me – and they went to school in the Soviet times. And of course, when people remember life when they were young, it doesn’t seem so hard. For example, my grandmother, she was deported to Siberia, like a lot of the Latvian population, in the ‘40s. And when I asked questions about how it was, she said “it was not so hard. It was interesting – it was not so hard work. I worked on my own property without vacations every day, but it was not so hard”, and so on. It’s interesting that they forget the bad things, and they try – for the survival of human beings, you should remember the good things. “Yes, we cried all the time, for these first two weeks when we went to Siberia, but after… If we compare, there were more pluses than minuses”. She survived, she returned to Latvia – of course, she lost everything – her farm and everything. This is interesting, but on the other hand, we should discount it. In my research, there is nothing about bad Russians, nothing about bad Russia. I just speak about reality and priorities in this period. How much in reality were the investments in the military sphere; how much expenditure was there on the Soviet army? How much revenue from Latvia went to the Soviet central budget? I speak about that – we lost a lot of investment in the population in the social sphere. And that was not only for Latvians, it was for Russians. Of course, there are some emotions. But if we don’t talk about this, people will live with the myths of the past. What is very important is to show the situation for the young generation. Of course, we can say that the older generation are partly lost – because they remember that time, and it’s not possible to change them. Some of them, yes, but I know a lot of them say “of course, I see your documents, but I don’t believe them. Because I remember it was better, this time”. These are their emotions, and it’s OK. My general aim is not to say that 80% or 90% or 100% of people should believe in my evidence and my interpretation of history, just it should be for society, and society should understand that there are interpretations and alternatives. Of course, you can believe the Soviet myth – you can stay with your Soviet myth and dreams from the past. But at the same time, you have the option to see reality. We published the documents last year in November, and after that I had a lot of interviews. I explained how it was, why it was and what was the situation. And afterwards a lot of people used my arguments – for example, in discussions, if you see on the internet – they use my arguments. And people believe them, because they’re based on documents. “Yes, it was interesting, it was good, but in reality, we see this”. The Russians which you asked about: this is why we publish and why we translate the publications into Russian. Because we should show all the population of the former Soviet Union that we should discuss these questions – how, for example, Mr. Putin says this is more a success story than an Empire of Evil, as Ronald Reagan called it. In general, this is a discussion for all of the population. Is it normal that the country invested one-third of all its revenues into the military sphere, the country ignored some democratic aspects? Compare the situation now and in the Soviet period. In Russia too – we can say of course that Russia is authoritarian and they control a lot of things – the media and so on. But if we compare it, Russia is more democratic now than it was in the Soviet period, because [then] it was totally controlled – all the media, everything. Of course, there is some repression, but if people with different views declared their opinions in the Soviet time, they would just be sent to prison or to a psychiatric institution. It’s very important to understand that to try to return to this system would be not only one step back, but many steps back. And this is very important for the younger generation. And the reason why the system collapsed was because it was not possible for it to support itself. It was not the bad West or anything like that; the system collapsed because it was not possible to do things. And if we compare living standards in the West and in the Soviet Union in the ‘80s – you cannot compare them. What I speak about and what I always try to say, is that I hope and I believe that in Russia in the future will change its strategic communication, and they will say that we will be a modern state like other modern states, and that of course we have some common history – the Soviet Union, but it was really organised by the Communist Party, and it was not a good example for us to try to follow or to try to return. This is perhaps maybe more a philosophical question, but it was because of that we published [these documents] – it’s important for Ukrainians, it’s important for Belarusians, it’s important for the Central Asian states, to understand this. Of course we can speak about the Soviet Union but we should understand the consequences of it. In the introduction to your research, you talk about how modern Russia uses this Soviet narrative to basically keep control over the former Soviet states, stopping them having their own foreign policy, etc. How can Latvia use the research you’ve done to support its current position against a potentially aggressive Russia? I think this is important if we are speaking about Latvia’s strategic communication. Of course we can use the results of the research. We can use the arguments – as I’ve always said, it’s a normal policy of cohesion. In the Soviet Union, the more developed territories supported the less developed territories. The same policy of cohesion now exists in the European Union – some less developed territories receive something from more developed territories. Of course, we can use this, because it’s evidence-based. I predict that in the future a discussion will be opened about Latvia, about the creation of the Latvian state – because it will be this anniversary of a hundred years [in 2018, the 100-year anniversary of the creation of the first Latvian state]. And it is very important that our arguments are research-based. Every country needs a narrative, but we should not build a narrative on emotions; our narrative should be built on true facts. For example, in the Ulmanis time, in the ‘30s, they tried to find in history – in the 13th century before the German invasion – independent states of Latvians. We cannot speak about Latvians [existing as an ethnic group at that time]. And if you build a narrative without facts, it’s falsification, it’s a fake. What we should use, we should use the values of our society – we are open. We always were an open, multicultural society – in Latvia for the last 700, 800 years, and before that. We are open, we understand each other, and we have values, like democracy. And I think in the future this will be very important. It’s interesting – we organised some media monitoring here, and before our presentations, there was a lot on Russian TV, in Russian newspapers, about this topic, about the investments from the Soviet period, and now we see that there is less. And I think it’s because… well, maybe they’re looking for other arguments, and now they’re preparing something (laughs). But we found that at first, they tried to discuss this, but because we had an argument; I think in strategic communication, it’s a pretty big victory for the Baltic states that we said that “no, the Soviet time was not a success story for us” – and it’s evidence-based that there were not any investments. Because, politically, they are not of course saying that [the Baltic states] freely joined the Soviet Union; the field of economics was the only point where they were trying to build this narrative. “Yes, of course, it was an occupation, but we invested, we invested.” Of course, I hope that we will not use my research to try to ask for some compensation. I think this is the wrong way. This is the past, and compensation is not the way. You can find out more about Gatis Krūmiņš’s work at his website (in Latvian and Russian).